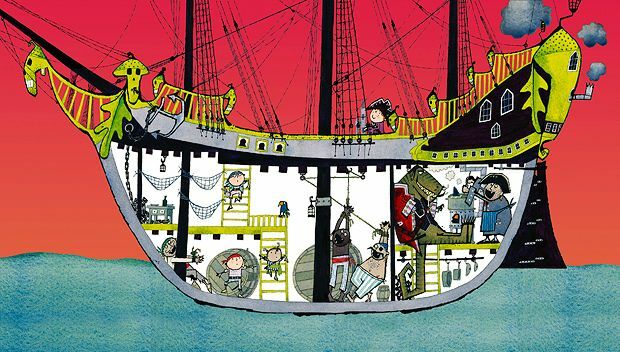 On a ramshackle pirate ship in the centre of a silken blue sea, big kid Flinn – a boy who loves drawing, jumping on trampolines and dinosaurs – embarks on an adventure that tests his mettle to the limit. Along with vivacious sidekicks, loudmouth Pearl and well-spoken Tom, Flinn persuades his giant, blue-haired teacher Miss Pie to set a treasure hunt, during which he discovers a depressed pirate who has lost his ship and needs some help getting it back. This is company Les Petits' first show as a children's theatre group, and there's much in this production – an adaptation of Giles Andreae and Russell Ayto's book – to show how carefully it has been thought through. Choosing a story set around the sea gives potential for strange and wonderful puppets – seagulls, a shimmering jellyfish – to pop up at any moment. Practical considerations have been made, such as creating a double height stage with better visibility for wee ones; and the delicate balance between menacing and softie is perfectly judged in the key villain, a colossal Tyrannosaurus Rex who wears a dressing gown and really really likes tomato ketchup. Nick Blakeley (Flinn) plays his childlike role with bags of verve and conviction, dashing about on his scooter, disposing of the baddie dinosaurs with nets and making sure they all get home in time for lunch. But tricks are missed, too. There's very little interaction, which could have drawn watching children further into the piece and made them feel more closely invested in the stakes. A glorious opportunity presents itself in the repetition of the three pirate attributes – eye patch, hook and 'arrrr' – but the kids are never invited to copy. Nevertheless, gentle songs and a swashbuckling plot make for a good colourful hour. Underbelly Bristo Square, 0844 545 8252, until 26 Aug (not 12, 22), 3pm (extra show 17 Aug 11am), £11–£12 (£10–£11). Les Petits Theatre Company return to the high seas with Captain Flinn and the Pirate Dinosaurs sequel The Magic Cutlass. When Flinn's classmates are kidnapped by his old nemesis Mr T the T-Rex he must find a magic cutlass to help rescue them.